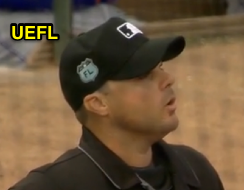 Umpire Nick Mahrley makes his MLB debut during Thursday's Mets-Rockies game in Colorado, joining Jim Reynolds' crew as the third base umpire alongside HP Umpire Jim Reynolds, 1B Umpire Brian Knight, and 2B Umpire Lance Barrett. The debut comes as a result of Wednesday's game-ending injury to Kerwin Danley, who would otherwise have been scheduled to serve as the third base umpire for Thursday's game. Mahrley is on the Pacific Coast League roster for the 2017 season, which is his fourth season in Triple-A. Mahrley previously umpired in the Gulf Coast, New York-Penn, Midwest, Carolina, Florida State, and Eastern Leagues. He recently served as plate umpire for the 2017 Triple-A All-Star Game. Mahrley wears the uniform number 48 at the Major League level, which was last worn by Anthony "AJ" Johnson, and makes his MLB debut at the age of 34. He resides in Phoenix, Arizona, is the fourth new fill-in umpire to make his debut during the 2017 regular season (Ryan Additon, 5/21/17; John Libka, 5/27/17; and Shane Livensparger, 6/10/17), and the first not to debut during a doubleheader. Marley most recently worked third base for Tuesday's Bees-Sounds game in Nashville, Tennessee.